Normally, witnessing backlash to backlash is about as riveting as watching paint dry, but this week has featured some interesting responses to the one-man callout culture that is Donald Trump. President Twitter’s attempts to take down Saturday Night Live have done nothing to dampen its hot streak of politician impression sketches, the latest courtesy of Melissa McCarthy. In fact, SNL’s hit a 20+ year high in its ratings, though it still must bow to the geeky tyranny of The Big Bang Theory. The Associated Press has another heartening example of weathering Trump’s bluster. Nordstrom’s stock is up after a brief dip following—what else?—a tweet from the 45th president that accused the retailer of being “unfair” to his daughter. No, not Tiffany (it’s never Tiffany). That would be Ivanka Trump, whose fashion line was recently dumped by Nordstrom for low performance. 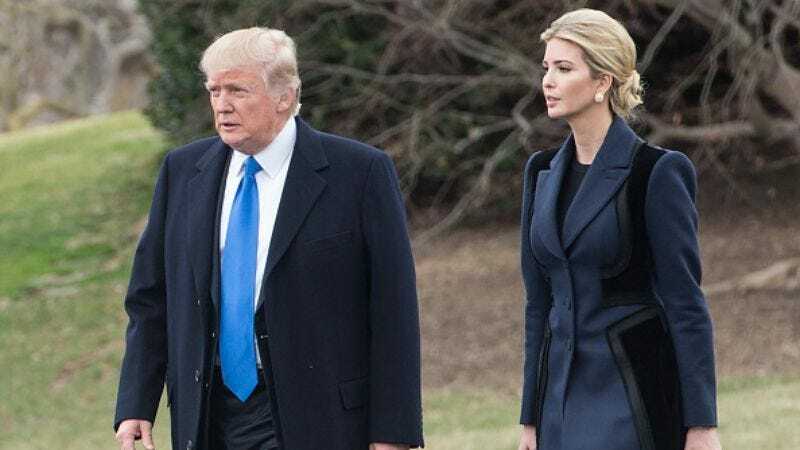 While advocating for the First Daughter, Trump didn’t commend her fashion sense or business acumen—he just reminded everyone that she might be the only thing that prevents him from sinking into Sauron levels of evil. The AP notes that although Nordstrom’s stock dropped by 22 cents (from $42.70 to $42.48) on Tuesday in the wake of the tweet, the price was $43.08 by Wednesday morning. Now, a corporation withstanding some presidential criticism is hardly the battle of Pelennor Fields, but it does remind us that even darkness must pass. A new day will come. And when the sun shines it will shine out the clearer—and, well, you know what we mean. UPDATE: If you thought this incident could pass without an official statement from the White House, you’d be wrong. Talking Points Memo reports that Press Secretary and Juicy Fruit enthusiast Sean Spicer told reporters at today’s briefing that Nordstrom’s decision to drop Ivanka Trump’s clothing and accessories was motivated by politics and not, as its bookkeepers and executives would probably suggest, underwhelming sales. According to Spicer, Nordstrom has taken exception with Trump’s executive orders. Given the response from the White House, we wouldn’t be surprised if the next executive order is a mandate for national uniforms, provided by Ivanka Trump’s “Women Who Work” line.